Sunday Bible Study– Begins at 10:30 am. 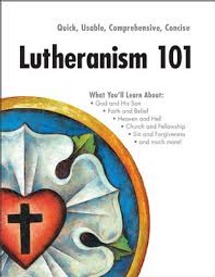 We are changing focus and studying our Lutheran Beliefs using the Book: LUTHERANISM 101. Copies will be prepared for those who attend the bible study but if you desire a copy of the book for yourself one can be ordered for $10.00. Young Adults Group - Begins at 10:30 am. This is not your normal group Bible study. We meet and discuss current events as well as how our Christian beliefs can help us at school and home...Open to confirmation age and older. Evening Bible Study - The Tuesday Evening Bible Study is at 6:00 pm; all are welcome to join. Ladies Bible Study – Tuesday morning Bible Study Class, beginning at 10 am. 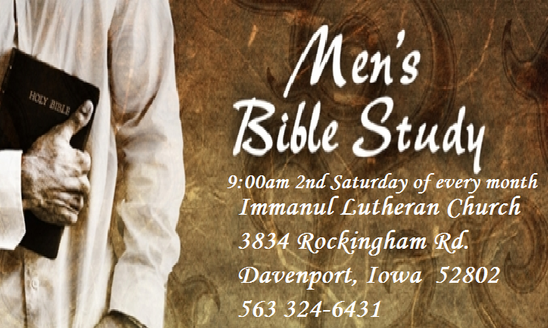 Men's Bible Study - 9:00am every 2nd Saturday of every month. Adult Instruction Class – Please call Church for details.